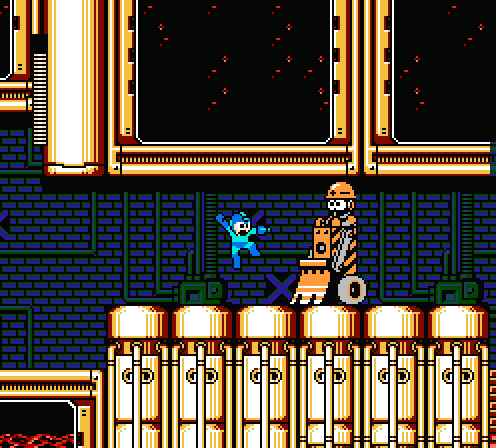 Mega Man (aka Rockman in Japan) is a widely known and wildly popular franchise for the NES by Capcom. 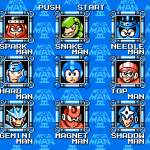 Mega Man is also most notably the longest series for the NES with 6 games in total, twice that of Nintendo’s own Super Mario Series. 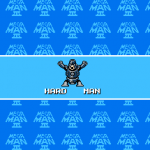 The Mega Man series follows a robot by the name of Mega Man, who was built by Dr. 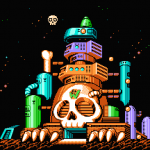 Cloud to defeat the evil robots built by Dr. Wily. 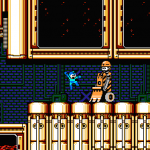 Along his journey Mega Man will acquire special abilities from the robots he has defeated and can use these abilities later to make defeating the rest of the robots easier. I will be reviewing the third installment of the series, which seems to be the most popular. 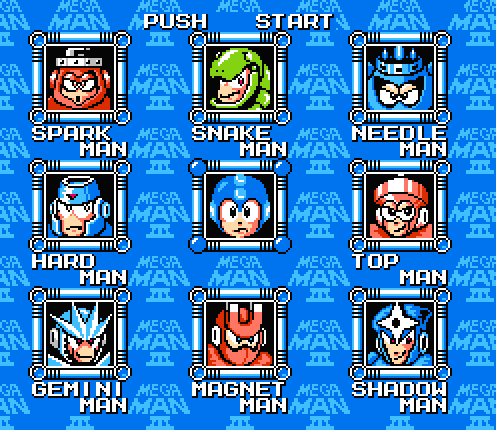 At the beginning of Mega Man 3 you have a total of 8 stages to choose from, each stage is controlled by the bosses you see on the choice screen. 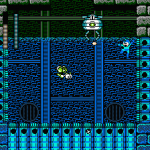 The stages are themed based upon the boss you chose and must fight at the end, also each stage has their own unique set of challenges, switching up the difficulty level in a fun way which always keeps you on your toes. As I said earlier, you will acquire each boss’ ability to help you defeat other bosses, so choosing the right boss the first time and knowing the exact pattern in which to beat them helps greatly, if you care more about beating the game rather than enjoying the challenge. After you have beaten the first 8 stages you then have to revisit 4 of those stages, each with 2 new bosses taking the place of the original boss, though these stages are shorter and more challenging. Now let me talk to you for a second about the difference between challenging and just plain stupid. 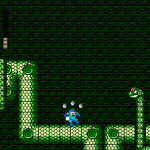 One example is after you defeat the first boss in the Needle Man revisited stage, you are required to use Rush Jet (Mega Man’s flying robotic dog) to fly across great distances. 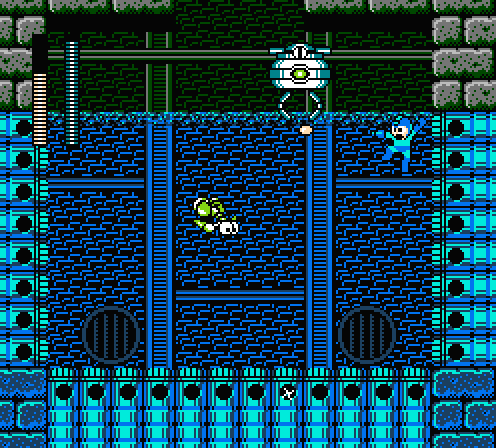 The stage gives you power-ups to replenish Rush’s jet energy just about the time he is running out, though if you happen to die in this stage you are thrust back before this section and these power-ups do not respawn, nor does Rush’s jet energy, rendering your hard work pointless. 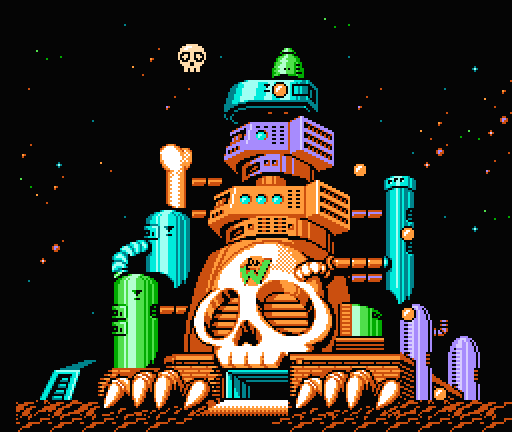 At this point you have to die a lot or reset your NES and start all over again until you learn not to die. 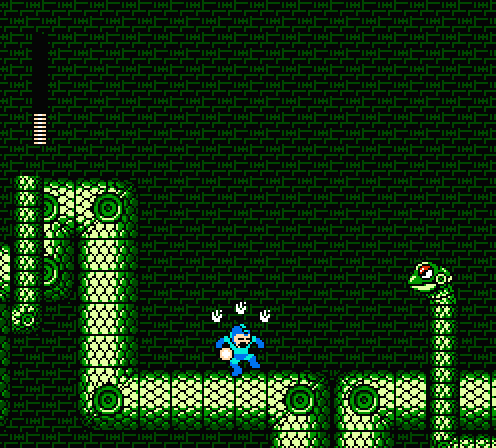 Since Mega Man does require a considerable amount of time and effort, it uses a password system so you don’t lose your progress. 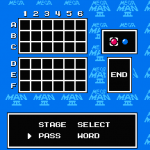 I happen to love this password system, it’s relatively simple and isn’t nearly as terribly mind-numbing as the password system for River City Ransom. 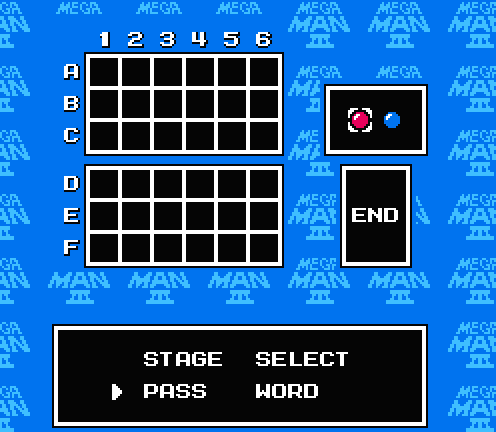 After you have lost all of your lives, the game will show you a screen consisting of 2 grids with red and/or blue dots within the grid to note your progress password. 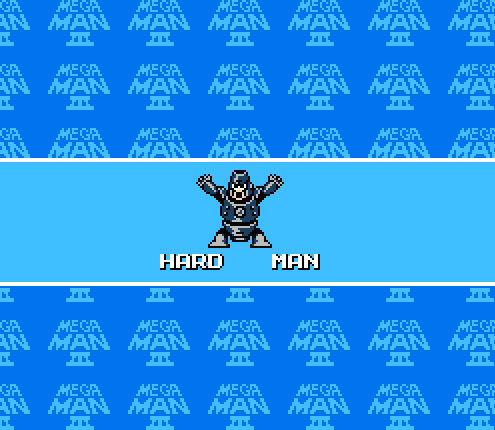 After you’ve defeated all 8 bosses from the revisited stages you must now fight Break Man, who was programmed by Dr. Light to periodically help train Mega Man throughout the game, though he seems more like a bad guy than a trainer. 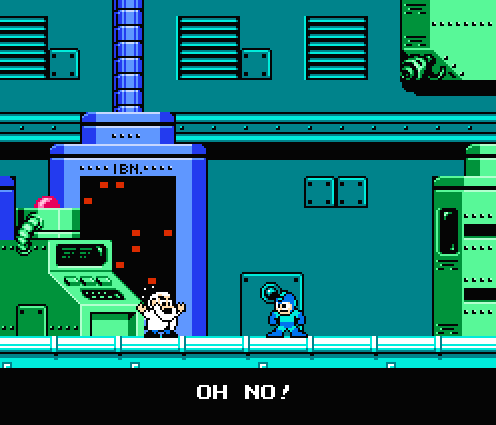 After this you will be sent to Dr. Wily’s castle, where you are presented with 6 more short stages, ending in your final battle with Dr. Wily. 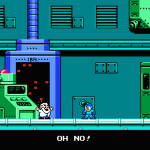 After you have defeated Dr. Wily, the world is safe again (until Mega Man 4)!